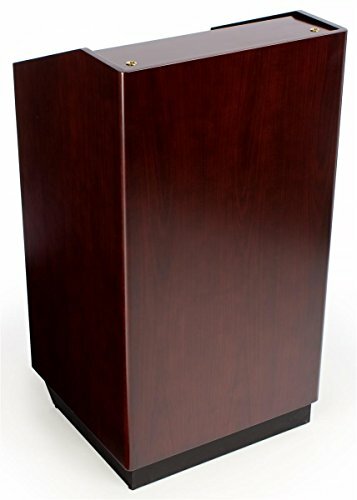 This lectern features 3/4-inch thick wood construction with a mahogany stained veneer finish. The veneer is stained and polished with a wood wax for a solid seal and an elegant look. Each of the 2 cabinet doors features a keyed lock to secure your equipment in the 3 shelves inside the lectern. The cabinet measures 24-inch (W) x 22-1/2-inch (D) but due to the door hinges the opening is 21-inch (W). These podiums make the perfect greeting stations in restaurants or hotels. Cable cutouts go throughout the lectern to make running wires for you're a/v equipment easy. (2) Wheels are built into the bottom of this podium for easy movement. Simply tilt the lectern back onto its wheels and roll it to its new location. The slanted reading surface of this lectern measures 24-inch (W) x 23-inch (D) and features a small lip to keep papers and literature from falling off. The overall measurements of this lectern are 25-1/2-inch (W) x 47-1/2-inch (H) x 23-1/2-inch (D) and weighs 130lbs. Lectern is constructed from 3/4" thick veneer finished wood. 3 Shelves built in to accommodate presentation aids. Large reading surface is slanted and measures 24-inch x 23-inch .